The role of TNF-α in the control of mycobacterial growth in murine macrophages was studied in vitro. Infection of macrophages from TNF-α gene disrupted (TNF-knockout (KO)) mice with recombinant Mycobacterium bovis bacillus Calmette Guérin (BCG) expressing the vector only (BCG-vector) resulted in logarithmic growth of the intracellular bacilli. Infection with BCG-secreting murine TNF-α (BCG-TNF) led to bacillary killing. Killing of BCG-TNF was associated with rapid accumulation of inducible NO synthase (iNOS) protein and the production of nitrite. The uncontrolled growth of BCG-vector was associated with low iNOS expression but no nitrite production. Thus, iNOS expression appears to be TNF-α independent but iNOS generation of NO requires TNF-α. In cultures of TNF-KO macrophages infected with BCG-TNF, inhibition of iNOS by aminoguanidine (AMG) abolished the killing of the bacilli. However, the growth of the organisms was still inhibited, suggesting an iNOS-independent TNF-α-mediated growth inhibition. To confirm this, macrophages from iNOS-KO mice were infected with either BCG-vector or BCG-TNF. As expected, no nitrite was detected in the culture medium. TNF-α was detected only when the cells were infected with BCG-TNF. In the iNOS-KO macrophages, the growth of BCG was inhibited only in the BCG-TNF infection. These results suggest that in the absence of iNOS activity, TNF-α stimulates macrophages to control the growth of intracellular BCG. Thus, there appears to be both a TNF-α-dependent-iNOS-dependent killing pathway as well as a TNF-α-dependent-iNOS-independent growth inhibitory pathway for the control of intracellular mycobacteria in murine macrophages. Tumor necrosis factor α plays a major role in the control of mycobacterial infection both in vivo and in vitro. The cytokine is required for the inhibition of growth of Mycobacterium tuberculosis in mice and for the development of the granulomatous response in the infected tissues (1, 2). The experimental addition of TNF-α to the culture medium of human monocytes infected in vitro with M. tuberculosis results in a reduction in the number of intracellular organisms (3). Moreover, when cultures of human alveolar macrophages infected with M. tuberculosis H37Ra are treated with polyclonal neutralizing Ab to TNF-α, intracellular mycobacterial growth in the macrophages increases (4). Although TNF-α is clearly necessary, how this cytokine contributes to the control of mycobacterial growth is not fully understood. TNF-α in combination with IFN-γ has been shown to activate macrophages, rendering the cells better able to control the growth of and/or kill intracellular organisms. This activation has been associated with the generation of reactive oxygen intermediates (ROI)4 (5, 6, 7). Cytokine-activated murine macrophages are also capable of generating reactive nitrogen intermediates (RNI). RNI have been shown to mediate the killing of mycobacteria within murine cells in vitro (8). Indeed, the results of Akaki et al. (9) suggest that RNI may be more important effectors than ROI in the control of intracellular mycobacteria infection in mouse macrophages in vitro. Pretreatment of mouse peritoneal macrophages with IFN-γ and TNF-α before infection potentiates the production of nitrites and is correlated with the antimycobacterial activity of the macrophages (10). In vivo, when the inducible NO synthase (iNOS) gene is disrupted, mice are unable to generate RNI and are highly susceptible to M. tuberculosis infection (11). To directly examine the role of TNF-α in these pathways, we have established an in vitro infection model using murine macrophages and recombinant bacillus Calmette Guérin (BCG) secreting murine TNF-α. Macrophages were prepared from the peritoneal cavity or the lungs of either wild-type mice or from mice with specific gene disruptions (TNF-α, iNOS, or IFN-γ). The macrophages were infected in vitro with recombinant BCG secreting murine TNF-α (BCG-TNF) and bacillary growth and mycobacterial survival were compared. In addition, the ability of the cultured macrophages to produce TNF-α, to express iNOS protein, and to release nitrites into the culture medium was evaluated. The studies reported here suggest that RNI are important for the killing of intracellular BCG in murine macrophages. However, RNI are not sufficient for maximal control of the survival and growth of the intracellular mycobacteria. The results indicate that even in the absence of any iNOS activity, intracellular mycobacterial growth in vitro can be controlled by TNF-α. Eight- to 10-wk-old C57BL/6 × 129 mice and homozygous TNF-α gene-disrupted (TNF-knockout (KO)) and homozygous iNOS gene-disrupted (iNOS-KO) mice on a C57BL/6 × 129 genetic background were used (12, 13). In addition, 8- to 10-wk-old BALB/c mice and homozygous IFN-γ gene-disrupted (IFN-KO) mice were used (14). The mice were kept under specific pathogen-free conditions at the University of Cape Town animal facility or at The Rockefeller University Laboratory Animal Research Center. Alveolar macrophages were obtained by a modification of the method described by Holt (15). Briefly, after a lethal dose of anesthetic, the animal was pinned onto a cork dissection board and the skin area overlying the trachea was dissected away. Overlying muscles and membranes were removed carefully by blunt dissection, taking care to avoid lateral neck vasculature. Once the trachea was fully exposed, it was cannulated using a sterile disposable 24-gauge i.v. cannula (0.7-mm diameter; Introcan, B Braun, Melsungen, Germany). The inner needle was removed and the cannula was sutured lightly into place using 4.0 silk suture on a round needle (Clinisutl; Sasurel, Port Elisabeth, Republic of South Africa). The dissection board was then tilted slightly so that the animal was in the head up position. Initially, 0.8 ml of DMEM (Life Technologies, Grand Island, NY) supplemented with lidocaine hydrochloride (lavage fluid; Sigma, St. Louis, MO) was instilled into the lung via the cannula. The fluid was left in situ for 3 min and then gently aspirated. The process was repeated five times with an increase in volume of lavage fluid to 1 ml. The lavage fluids from repeated washes were pooled. Peritoneal macrophages were obtained by lavage of the peritoneal cavity using a standard procedure (16). Briefly, the skin overlying the abdomen was dissected away and the peritoneal cavity was flushed with 5 ml of cold DMEM using a heparinized syringe and a 26-gauge needle. The lavage fluid was removed with a sterile glass pasteur pipette. Both alveolar and peritoneal lavage fluids were centrifuged (1000 rpm) for 8 min at 4°C. Cells were washed in cold DMEM and then suspended in DMEM supplemented with 10% FCS (Gemini, Calabasas, CA), 2 mM l-glutamine, 100 U/ml penicillin, and 100 μg/ml streptomycin (complete medium; Life Technologies) and plated in 48-well plates at 5 × 105 cells/well. After 2 h of incubation at 37°C to allow adherence, the cells were washed with warm complete medium and then incubated overnight. Before infection, cells were washed with complete medium without antibiotics. All reagents used are LPS free. Recombinant Mycobacterium bovis BCG Montreal strain secreting murine TNF-α (BCG-TNF), or secreting murine IFN-γ (BCG-IFN) or containing the vector only (BCG-vector) were a kind gift from Richard Young (Whitehead Institute, MIT, Cambridge, MA). Murine cDNA for TNF-α or IFN-γ was cloned into the plasmids pRBD3 and pRBD4 as described elsewhere (17). The expression vectors contained a kanamycin resistance gene. The BCG-TNF, BCG-IFN, and BCG-vector were grown to mid-log phase in Middlebrook 7H9 medium containing kanamycin (18 μg/ml; Difco, Detroit, MI) with minimal agitation for 7 days (18). These three recombinant strains had similar rates of growth in liquid medium (generation times of 37–38.5 h). BCG-vector, BCG-IFN, or BCG-TNF were suspended in complete medium without antibiotics at 37°C and added to 18-h macrophage cultures at a multiplicity of infection of 1 mycobacterium per macrophage (multiplicity of infection of 1:1). Bacilli were phagocytosed fully with no organisms remaining in the extracellular medium, by 6 h of culture as evaluated in pilot studies. The cultures were therefore not washed after addition of the mycobacteria to the cells. To assess intracellular growth of recombinant BCG, infected macrophage monolayers were probe sonicated (model 60 sonic dismembrator; Fisher Scientific, Springfield, NJ) four times at 5-s pulses/well to release intracellular bacilli. Bacterial suspensions were serially diluted and plated on kanamycin-supplemented 7H11 agar plates. The number of viable bacilli was evaluated by counting individual colonies using a magnifying microscope after 2–3 wk of growth at 37°C. Each dilution was plated in multiples of six and a mean colony count was obtained. Generation time of mycobacterial growth from day 1–5 or 6 was determined using the equation TD = (log2/slope) × 24 h as described previously(19). Macrophage culture supernatants were removed and stored at −70°C before cytokine analysis by ELISA. TNF-α, IL-12, IL-10, and IFN-γ were measured in the culture supernatant using commercial kits (Endogen, Boston, MA) according to the manufacturer’s specifications. Cell lysates were prepared from peritoneal macrophage monolayers at 8, 24, and 48 h after infection with recombinant BCG as previously described (20). Cell lysates were subjected to electrophoresis on a 4–15% SDS-polyacrylamide gel and transferred to nitrocellulose. Immunoblots were probed for IRF-1 (48 kDa) using a rabbit anti-IRF-1 Ab (1:2000 dilution; Santa Cruz Biotechnology, Santa Cruz, CA) and for iNOS (130 kDa) using a monoclonal anti-iNOS Ab (1:1000; Transduction Laboratories, Lexington, KY). HRP-conjugated anti-rabbit or anti-mouse secondary Abs (Pierce, Rockford, IL) were used to visualize the bands by chemiluminescence (21). The production of nitrite by peritoneal macrophages was measured in culture supernatants at 24 h by the Griess assay (22). One hundred microliters of culture supernatants was mixed with 100 μl of modified Griess reagent (Sigma) and incubated for 10 min. Absorbance was measured at 570 nm in an ELISA microreader (Opsys MR; Dynatech, Chantilly, VA). A standard curve of NaNO2 was used to establish the NO2− concentration in the samples. iNOS activity was inhibited using aminoguanidine (AMG; Sigma). A stock solution of AMG (1 M) in sterile normal saline was prepared. AMG was added to each well at a final concentration of 1 mM at the time of infection with recombinant BCG (23). Peritoneal or alveolar macrophages from both TNF-KO and wild-type control mice were seeded into wells on plastic coverslips and infected either with BCG-TNF or BCG-vector at a multiplicity of infection of 1:1. Coverslips were removed on day 1 after infection, fixed in 1.0% glutaraldehyde in 0.1 M cacodylate buffer (pH 7.4) for 1 h at 37°C, and postfixed in 1.0% osmium tetraoxide in 0.1 M cacodylate buffer (pH 7.4). After washing in buffer, the cells were stained en bloc with 2.0% uranyl acetate and then subjected to dehydration in ascending alcohol series, followed by embedding in Epon (Fluka, Buchs, Switzerland). Poststained sections were examined and photographed in a JEOL electron microscope. To investigate the role of TNF-α in the control of intracellular mycobacterial growth, peritoneal macrophages from TNF-KO mice were infected in vitro with either BCG-vector or a recombinant BCG secreting murine TNF-α (BCG-TNF). Electron microscopic examination of the infected TNF-KO macrophages revealed that both BCG-vector and BCG-TNF were phagocytosed efficiently by the peritoneal and by the alveolar macrophages. 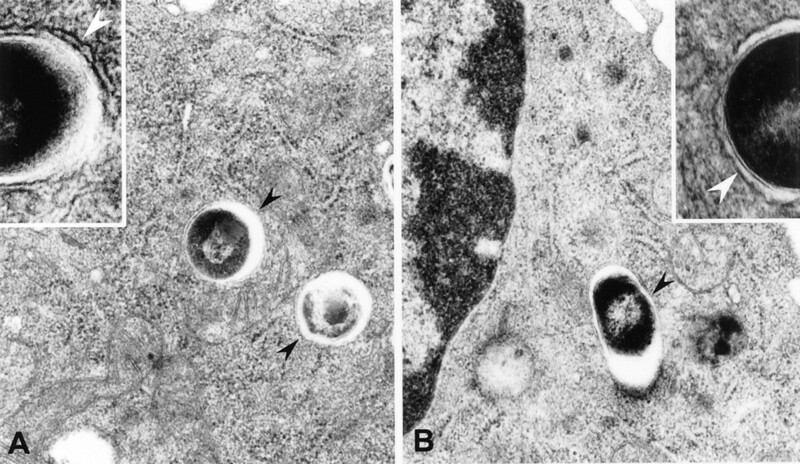 At 8 h after infection, single organisms were found within phagosomes in the cytoplasm of the cells (Fig. 1⇓). The double membrane of the phagocytic vacuole was tightly apposed to the mycobacterial cell wall of either recombinant strain. No obvious morphologic differences were noted between the phagocytosed BCG-vector (Fig. 1⇓A) and BCG-TNF (Fig. 1⇓B). Similarly, no differences in the morphology of the macrophages were noted following phagocytosis of BCG-vector compared with BCG-TNF. Morphology of macrophages infected with recombinant BCG in vitro. A, Electron microscopy micrograph of alveolar macrophages from a TNF-KO mouse infected with BCG-vector. Inset in A, Enlarged area of peritoneal macrophage infected with BCG-vector. B, Electron microscopy micrograph of alveolar macrophage from a TNF-KO mouse infected with BCG-TNF. Inset in B, Enlarged area of peritoneal macrophage infected with BCG-TNF. Black arrowheads show individual bacilli within a phagocytic vacuole in the cytoplasm of the cells. White arrowheads in insets show the double membrane of the phagocytic vacuole. Original magnification, ×26,000; insets, ×55,000. Following infection of either peritoneal or alveolar macrophages obtained from TNF-KO mice, an initial delay in growth of BCG-vector was noted (Fig. 2⇓). Thereafter, the number of BCG-vector, evaluated daily by CFU assay, increased steadily for the next 5 days. 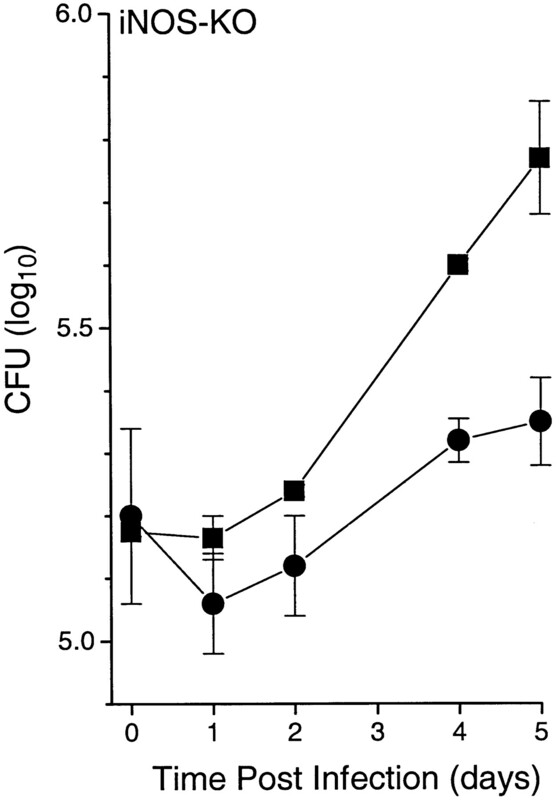 The number of bacilli during this period increased ∼10-fold with a generation time of ∼30 h (Fig. 2⇓ and Table I⇓). In contrast, when peritoneal macrophages from TNF-KO mice were infected with BCG-TNF, the number of viable mycobacteria decreased from the time of infection. A statistically significant difference in intracellular bacillary numbers between the two recombinant strains was noted by day 3 after infection (p = 0.005; Fig. 2⇓). When wild-type peritoneal macrophages were infected with recombinant BCG, both BCG-vector and BCG-TNF were killed at similar rates (Fig. 2⇓ and Table I⇓). Thus, the presence of TNF-α, whether of host or pathogen origin, was required for the intracellular control of growth and killing of the organisms. Effect of TNF-α on the survival and growth of recombinant BCG in peritoneal (top) and alveolar (inset) macrophages in vitro. Macrophages from TNF-KO mice (▪, •) or from wild-type mice (□, ○) were infected with BCG-vector (▪, □) or BCG-TNF (•, ○). ∗, Statistically significant (p < 0.05) differences in bacillary load between BCG-vector and BCG-TNF-infected macrophages. Results are means ± 1 SEM of four independent experiments, each conducted in duplicate. When alveolar macrophages from TNF-KO mice or wild-type mice were infected with either of the BCG strains, the same pattern of growth vs bacillary killing was noted. After an initial delay, alveolar macrophages from TNF-KO mice supported the growth of the BCG-vector (Fig. 2⇑, inset). 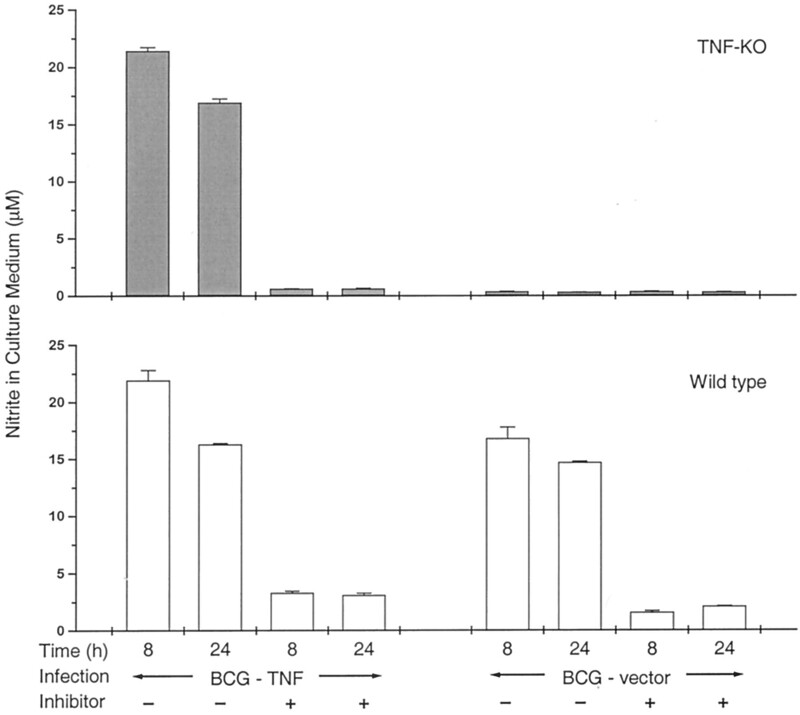 The generation time in this case was ∼34 h. However, the TNF-KO alveolar macrophages killed BCG-TNF as did the alveolar macrophages from wild-type mice infected with either strain (Fig. 2⇑, inset). These observations suggest that murine peritoneal and alveolar macrophages control intracellular growth of BCG similarly and that TNF-α is required for control of mycobacterial infection. To examine the role of iNOS expression during growth or killing of BCG in infected macrophages, Western blot analysis of cell lysates was conducted at 8, 24, and 48 h after infection. Uninfected peritoneal macrophages from wild-type mice or from TNF-KO mice did not express iNOS at any time point (data not shown). These cells did, however, express the IFN-γ-induced protein IRF-1. Infection of macrophages from TNF-KO mice with BCG-vector resulted in delayed low levels of iNOS protein expression compared with protein expression following infection with BCG-TNF. Thus, at 8 h after infection, iNOS protein was clearly detectable only in macrophages infected with BCG-TNF (Fig. 3⇓, lane 3). By 24 h, low levels of iNOS protein were also detected in macrophages infected with BCG-vector (Fig. 3⇓, lane 1) while higher levels of the protein were induced by infection with BCG-TNF (Fig. 3⇓, lane 3). When macrophages from wild-type mice infected with BCG-vector (Fig. 3⇓, lane 5) were compared to infection with BCG-TNF (Fig. 3⇓, lane 7), iNOS expression was similar to that seen when macrophages from TNF-KO mice were infected. By 48 h postinfection, iNOS was undetectable in any of the cell lysates (data not shown). IRF-1 was expressed in all infected cultures at 8 h, reduced by 24 h (Fig. 3⇓), and undetectable by 48 h (data not shown). These observations suggested that iNOS induction in the macrophages did not require TNF-α. However, if TNF-α was present, iNOS protein was expressed earlier and at higher levels. Effect of TNF-α on protein expression in peritoneal macrophages infected with recombinant BCG in vitro. 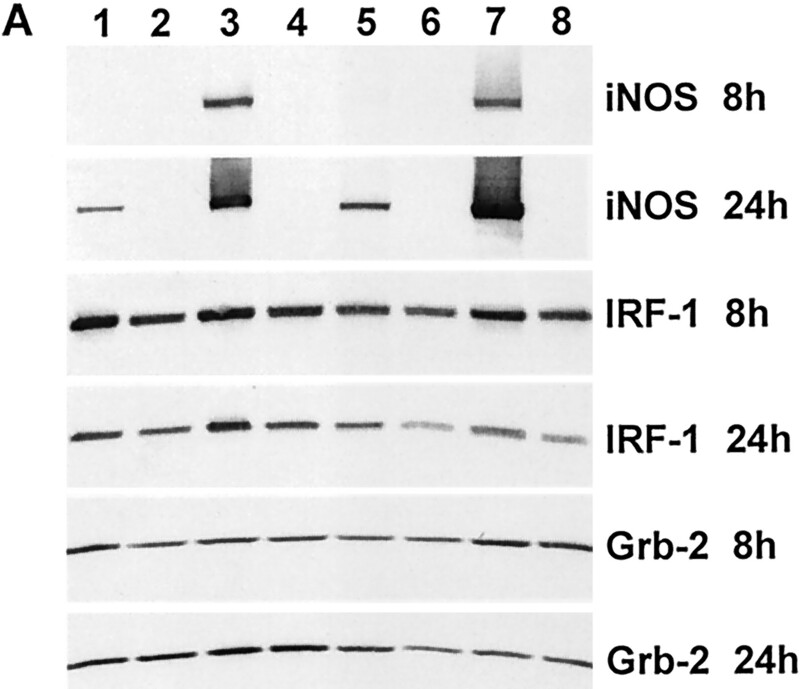 Cell lysates were analyzed by Western blot for the expression of iNOS, IRF-1, and Grb-2 at 8 and 24 h after infection. Lanes 1 and 2, Macrophages from TNF-KO mice infected with BCG-vector; lanes 3 and 4, macrophages from TNF-KO mice infected with BCG-TNF; lanes 5 and 6, macrophages from wild-type mice infected with BCG-vector; and lanes 7 and 8, macrophages from wild-type mice infected with BCG-TNF. The iNOS inhibitor AMG was added to the macrophage cultures represented in lanes 2, 4, 6, and 8. When the iNOS inhibitor AMG was added to the culture supernatants, the expression of the protein was fully abrogated in both TNF-KO and wild-type macrophages following infection with either recombinant BCG strain (Fig. 3⇑, lanes 2, 4, 6, and 8). AMG in the culture supernatants did not affect substantially the expression of IRF-1. To investigate whether TNF-α affected iNOS activity in macrophages infected with recombinant BCG, nitrite accumulation in the culture medium was evaluated. TNF-KO peritoneal macrophages infected with BCG-vector in vitro produced no nitrite (Fig. 4⇓ and Table I⇑). However, when the cells were infected with BCG-TNF, nitrite production was observed. The presence of AMG in the culture supernatants fully inhibited this activity. 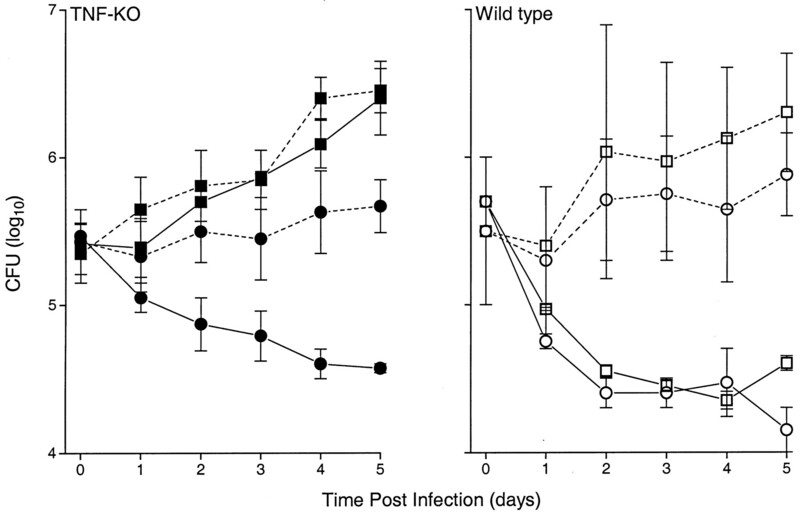 When peritoneal macrophages from wild-type mice were infected, both BCG-vector and BCG-TNF induced nitrite production (Fig. 4⇓ and Table I⇑). AMG added to these cultures significantly reduced nitrite production. These results suggested that TNF-α is required for iNOS enzymatic activity although it does not appear to be required for iNOS expression (Fig. 3⇑). Effect of AMG on nitrite production by peritoneal macrophages from TNF-KO or wild-type mice infected with recombinant BCG. Concentrations of nitrite in the culture medium of the cells are expressed as means ± SD of two independent experiments, each conducted in duplicate. The effect of inhibition of iNOS activity by AMG on BCG growth and survival was studied next. The presence of AMG in the cultures had no effect on the growth of BCG-vector in the TNF-KO peritoneal macrophages (Fig. 5⇓ and Table I⇑). However, the drug rendered these macrophages less capable of controlling the BCG-TNF infection. Under these inhibitory conditions, the number of BCG-TNF in the infected TNF-KO macrophages were not reduced. Rather, the number of bacilli increased very slowly, resulting in less efficient growth compared with the BCG-vector (generation time of 89 h vs 33 h, respectively). In macrophages from wild-type mice infected in vitro with either BCG-vector or BCG-TNF, the addition of AMG abolished the killing of the bacilli and rendered these macrophages more permissive to mycobacterial growth (Fig. 5⇓ and Table I⇑). However, in the presence of excess TNF-α (infection with BCG-TNF) the organisms grew more slowly than BCG-vector (66-h vs 34-h generation times). Thus, when TNF-α is present, inhibition of nitrite production only partially restores the growth of the bacilli. Effect of AMG on survival and growth of recombinant BCG in macrophages in vitro. Macrophages from TNF-KO mice (▪, •) or from wild-type mice (□, ○) were infected with BCG-vector (▪, □) or BCG-TNF (•, ○). AMG was added to some of the cultures (dotted lines). Results are means ± SD of two independent experiments, each conducted in duplicate. The cytokines produced by the peritoneal macrophages infected with recombinant BCG were measured by ELISA. Macrophages from wild-type mice infected in vitro with BCG-vector or BCG-TNF secreted TNF-α into the culture medium. In contrast, when peritoneal macrophages from TNF-KO mice were infected, TNF-α was found in the culture medium only if the cells were infected with BCG-TNF. The addition of AMG to the culture medium reduced the amount of TNF-α present in the medium whether the cytokine was of host or bacterial origin (Table I⇑). To directly examine the role of NO production in the control of mycobacterial infection in vitro, peritoneal macrophages from iNOS-KO mice were infected in vitro with either BCG-vector or BCG-TNF (Fig. 6⇓ and Table I⇑). As expected, no nitrite was detected in the culture medium of the BCG-vector infected cells. TNF-α was detected only when the cells were infected with BCG-TNF. The growth of the BCG was inhibited in the BCG-TNF infection (generation time, 98.9 ± 7.9 h) compared with the BCG-vector infection (46.9 ± 6.5 h; p = 0.001). These results suggested that even in the absence of iNOS, TNF-α stimulates macrophages to partially control the intracellular BCG. Effect of iNOS on the growth of recombinant BCG in peritoneal macrophages in vitro. Macrophages from iNOS-KO mice were infected with BCG-vector (▪) or with BCG-TNF (•). Results are means ± 1 SD of two independent experiments, each conducted in duplicate. BCG-TNF infection (generation time, 98.9 ± 7.9 h) compared to the BCG-vector infection (46.9 ± 6.5 h; p = 0.001). These observations were confirmed when peritoneal macrophages from the IFN-γ gene disrupted (IFN-KO) mice were infected in vitro with either BCG-vector or BCG-TNF. Again, no nitrite was detected in the culture medium of the cells infected by either recombinant (Table I⇑). TNF-α was detected only when the cells were infected with BCG-TNF. IFN-KO macrophages partially controlled the growth of BCG-TNF (generation time, 72 h) but not of BCG-vector (34 h). Surprisingly, when the IFN-KO macrophages were infected with BCG-IFN-γ, the presence of IFN-γ in the culture medium (19.7 ± 1.6 pg/ml) did not restore the production of nitrite by the macrophages (Table I⇑). TNF-α was not detected in these cultures. The presence of IFN-γ did not affect growth of the recombinant BCG (generation time of 30 h for BCG-IFN-γ compared with 27 h for BCG-vector). Thus, TNF-α appeared to be required for control of intracellular growth of BCG and the presence of IFN-γ could not compensate for the absence of TNF-α. These studies show an unequivocal role for TNF-α in the killing of mycobacteria (iNOS dependent) and in the control of mycobacterial growth (iNOS independent) in murine macrophages in vitro. Although both recombinant strains of BCG used here were phagocytosed similarly as shown morphologically by electron microscopy, the subsequent fates of the strains were very different. In the absence of any TNF-α, whether of macrophage origin or from recombinant BCG-TNF, the macrophages from TNF-KO mice could neither control the growth of nor kill BCG. However, when TNF-α was added back by infection with BCG-TNF, the replication of the infecting organisms was reduced and the number of viable bacteria was decreased. This was also noted in vivo: when TNF-KO mice were infected with recombinant BCG-TNF, the number of infecting BCG-TNF was reduced whereas BCG-vector grew in all organs tested (24). Similarly, in human macrophages infected in vitro with M. tuberculosis, it has been shown that when TNF-α is added, the cells are more efficient at curbing the growth of the bacilli than when other cytokines or cytokine combinations, including IFN-γ, are added (3). The relative lack of effect of IFN-γ may be explained by recent findings of Ernst and colleagues (25, 26), who have shown that IFN-γ fails to activate human macrophages to kill M. tuberculosis. They have recently found that M. tuberculosis infection blocks macrophage responses to IFN-γ via the direct binding of cell wall components to the nuclear transcription factor CBP/p300, thereby sequestering it and preventing its interaction with STAT1, precluding further transcription (25, 26). The mycobacteriocidal effect of TNF-α observed in the present study appeared to be associated with iNOS-mediated production of NO. Interestingly, when AMG was added to these cultures to block nitrite production, the antimicrobial activity was less efficient, although not fully inhibited. The bacilli were not killed but their growth was inhibited. This result suggested the presence of an iNOS-independent TNF-α-dependent antimycobacterial activity. Furthermore, infection of macrophages prepared from iNOS-KO mice confirmed the observation of an iNOS-independent but TNF-α-dependent mycobacterial growth inhibitory activity. The iNOS-independent but TNF-α-dependent antimycobacterial activity could be mediated by ROI. The ROI pathway has been studied using respiratory burst-deficient gp91 (phox−/−) mice (27). These mice are particularly susceptible to mycobacterial infection early in the course of infection. In vitro, the oxidative burst has been shown to be important in the control of intracellular infection with other pathogens (28). Recent reports suggest that cytokine treatment of host macrophages facilitates maturation and acidification of the vacuoles (29, 30). We have recently shown that acidification of the phagocytic vacuole inhibits the growth of intracellular M. tuberculosis (31). Thus, TNF-α may facilitate acidification of the late phagosome-lysosome vacuole via an oxidative mechanism leading to the M. tuberculosis growth inhibition seen in this study. It is also possible that the role of the oxidative pathway in mycobacterial killing may have been underestimated in previous studies in which AMG was used as a specific inhibitor of RNI (23). Recently we have observed that AMG inhibited the ROI pathway as well as the RNI pathway (our unpublished observations). Tian et al. (32) have also shown that an inhibitor of the ROI pathway (e.g., catalase) affects NO production in an arginase-dependent manner. These results suggest caution in interpreting results of experiments with inhibitors (32). Some investigators have suggested that RNI are more important than ROI in the control of mycobacterial growth by murine macrophages (9). In the mouse model, macrophage activation results in iNOS induction (11). iNOS then catalyzes two sequential monooxygenase reactions to convert l-arginine to l-citrulline resulting in the production of NO. It is NO and other RNI that are toxic to mycobacteria. In the present studies, iNOS protein was expressed in the macrophages even in the absence of TNF-α. However, the enzyme appeared to be inactive, since nitrite was not detected in the culture supernatant of infected cells, and the intracellular mycobacteria were not killed. Similarly, iNOS protein has been shown to be expressed in the macrophages of mycobacteria-infected TNF-α receptor gene-disrupted mice (TNFR-KO) (1) and TNF-KO mice (2, 24), even in the absence of TNF-α or TNF-α signaling. However, since the infection was not controlled in all of these in vivo studies, either the enzyme was not active or it was not activated efficiently enough or early enough. Only when TNF-α was present were high levels of nitrites found in the culture supernatant and the organisms killed. Thus, the enzymatic function of iNOS rather than its expression, appears to require TNF-α. Why the enzyme appears to be inactive in the absence of TNF-α is as yet unclear. How may BCG infection induce the expression of iNOS in the absence of TNF-α? Recent studies have demonstrated that mycobacteria activate macrophages via the Toll-like receptor 2 (TLR2) (33, 34), leading to activation of NF-κB, which in turn results in the up-regulation of genes for cytokines such as TNF-α and enzymes such as iNOS. TLR2 may thus be utilized by BCG to induce iNOS in the TNF-KO macrophages (35). Taken together with the previous observations, our results suggest that both the TLR2 pathway and the TNF-α signaling pathway are required for killing of mycobacteria by murine macrophages. In this study, we have observed both a TNF-α-dependent-iNOS-dependent and a TNF-α-dependent-iNOS-independent antimycobacterial mechanism. Since iNOS has been difficult to demonstrate in human mononuclear phagocytes, the TNF-α-dependent-iNOS-independent pathway may be a significant pathway in controlling human mycobacterial infection. We thank Dr. Victoria Freedman for help with preparation of this manuscript, Marguerite Nulty for secretarial assistance, and Judy Adams for preparation of the figures. ↵1 This work was supported by Public Health Service Grants AI 42056 and AI 22616 (to G.K.). L.-G.B. was a Fogarty International Fellow (Grant AITRP TW00231 to Colombia University, New York, NY). ↵2 Current address: Infectious Disease Clinical Research Unit, University of Cape Town, Lung Institute, P.O. Box 34560, Groote Schuur 7937, Cape Town, South Africa. ↵4 Abbreviations used in this paper: ROI, reactive oxygen intermediate; RNI, reactive nitrogen intermediate; iNOS, inducible NO synthase; BCG, bacillus Calmette Guérin; KO, knockout; AMG, aminoguanidine; TLR2, Toll-like receptor 2. Willet, H. P. 1992. Physiology of bacterial growth. In Zinsser Microbiology, 20th Ed. W. K. Joklik, H. P. Willet, D. B. Amos, and D. M. Wilfert, eds. Appleton & Lance, Norwalk, CT, p. 53.